Car rescue kid Nathan Pearce got to meet his Motherwell FC heroes! 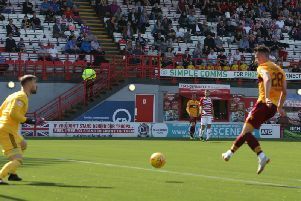 It has been a traumatic month for young Motherwell fan Nathan Pearce, but January has at least produced a more positive memory as the youngster led out his beloved side ahead of their 1-0 victory over Hibernian at Fir Park. Earlier in the month, Nathan’s dad Stuart was in a car accident as he was picking up Nathan from his mum’s house. While sitting in his parked car, Stuart’s vehicle was hit by another motorist, sending it crashing into a nearby house. But Nathan’s quick thinking led him to go back into the house to grab a knife before cutting his dad’s seatbelt and helping him from the accident with only minor injuries. The Well Society invited ’Well fan Nathan to the Hibs game where he had an unforgettable night. Nathan met all of the players on the evening – even managing to get a picture with his favourite player Tom Aldred – before running out with the team and helping inspire them towards a fine performance and 1-0 win against Hibs. Dad Stuart is starting to recover and was even able to make it to Fir Park for Nathan’s big night. Stuart said: “I am proud of Nathan for keeping cool in a traumatic situation in helping me out of the car. “His night as the mascot for Motherwell made a welcome change and helped take our minds off things. “I would like to sincerely thank the Well Society for their concern and letting Nathan be the mascot.